Imagine what would happen if you were better at every single thing you do. A few weeks ago, I experienced something totally unexpected and a little bit crazy. I was standing in a room with about three hundred other people. On the stage in front of us was an unassuming guy in a suit and tie. He claimed that, among other things, he could have us all doing complex math equations in our heads in a matter of minutes. To tell you the truth, I almost walked out of the room right then and there. I'm so glad I didn't. First, this man (Howard Berg is his name) gave us a bunch of pretty tough math problems. Nothing I'd ever attempt without a calculator. Then, he gave us a simple technique for solving them. And just like that, I was rattling the right answers off the top of my head. I mean whipping through them like they were 2+2 (they were more like 327 x 859.) This from a guy who… well, let's just say math has never been my strong suit. That wasn't all. He gave us another technique and suddenly, I was able to recall huge amounts of information at will. No notes or anything. It was one of the coolest things that has ever happened to me. But not because I was able to do it. I fully believe that you and I are capable of doing just about anything we put our minds to. What if you could do that… with EVERYTHING? You and I both know that learning is the real key to any kind of success. It's why you're a Nightingale-Conant customer, and why I believe so strongly in our products and in what I do every day. And there's no doubt that today, there's no more valuable commodity than information. So I'm sure you can agree with the idea that the more you can learn and the faster you can learn it, the faster you'll get to where you want to be. The point of the demonstration I experienced was that anyone can learn anything a whole LOT faster than they realize. It doesn't have anything to do with intelligence or talent. to get the right results! Could you make more money, either in your own job, or by getting a different one, if you knew more (about a particular subject, technology, process, software program, etc.)? Is there anything wish you could do — go back to school, learn a different language, pursue a new hobby, that kind of thing — but haven't, because you don't think you have the time? Are you ever frustrated that you have to pay an "expert" to help you with something that doesn't seem all that hard, just because you lack the knowledge to do it yourself? Luminaries in personal development and human potential, like Brian Tracy and Colin Rose, renowned speed reading expert Howard Berg, breakthrough educator Donna Cercone, and world-record-holding memory expert Dominic O'Brien, are your ultimate faculty, delivering the skills you need to richly transform every area of your life from the inside out! Activate your hidden knowledge and intelligences to absorb volumes of dry technical training material, so you become a master on any subject you desire. Optimize your brain functions to blissfully eliminate stress and enhance every area of your life. Rapidly master any skill, job function or essential technique for success in whatever you want to do, know or be. Put lay-offs behind you: Become a highly paid, valued resource in your job because of your superhuman ability to comprehend and apply new ideas and concepts. Learn a new language in record time. Memorize and instantly recall scads of important critical data, astounding your boss, customers and coworkers. Convert theoretical data and high-level concepts to useful knowledge you can apply in your profession and personal life. Get on the fast track to success in your entrepreneurial business, career – or life itself. And so much more... just wait until you see all we have in store for you! When you harness the mental powers of your mind, you unleash its potential to create the successful business you want, the amazing career you desire, and the life of your dreams. And the key unlocking this potential for you is your ability to learn quickly and easily. Therefore, my staff and I have personally hand-selected the programs that make-up this life-changing course to get you these powerful results in the shortest amount of time possible. How to access your potential genius – to be the problem-solver employers and customers depend on for moneymaking solutions. How to identify your dominant intelligence and preferred method of learning, cutting study and preparation time in half. How to succeed in an information-rich world by mastering the art of speed reading – enabling you to slice though a thick business or tech manual like a hot knife through butter. How to pour on the speed, developing the highly profitable and efficient time and money-saving habits of speed learners. How to harness the way the brain operates, boosting your decision making powers to genius level. The exhilarating experience of exploring your genius mind – on a flying magic carpet! Accelerated Learning Techniques – 6 CDs, Writable PDF Workbook, Bonus CD titled Relaxation & Visualization Techniques and Baroque Music to Set the Mood – a $79.95 value. How to awaken and activate the genius inside you ... it's easier than you think. Secrets of creating and sustaining a positive mental attitude essential to learning and channeling success. How to easily convert mountains of dry theoretical concepts into useful everyday knowledge you can apply in your business as well as personal life. Stand out at networking events and other social and business gatherings; use this slick visual technique to easily remember names and faces. Cut study time half – and then some, by turning speed reading into power reading so that you can digest and comprehend a data laden textbook in mere hours rather than days or weeks. Become a powerful communicator - on paper and in person – a powerful moneymaking skill ... and so much more! 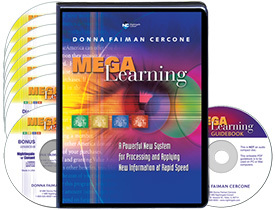 You'll also receive a great compendium of all that's revealed in this program on the Accelerated Learning Techniques In Action DVD. Your fantastic resource to help solidify and summarize the concepts on the audio, including how to double your reading speed, improve your memory, boost your creativity and triple your vocabulary. Provides a quick and easy reference and review whenever it's convenient – a $29.95 value. Read a book in 15 minutes! Next, the world's fastest reader, Howard Berg, will give you his secrets of succeeding in today's information-rich world. Allow Howard Berg to teach you to absorb and comprehend any material you need to study – while boosting your reading speed to unimaginable levels in just a few short hours! Safeguarding yourself from getting left behind; stay relevant, current - on top of the latest information by ramping up your reading speed. Drastically improving comprehension, retention and recall for all types of material – you won't see this coming. Understanding the differences in reading for pleasure, work, self-study and highly technical materials – and why it's important to your career. Staying focused and relaxed under the pressure of exams by developing "this" unusual form of intelligence. Coordinating these three natural components, boosting reading speed to blazingly fast levels. Leveraging what you read to its fullest potential in the real world – and that means, making money ... and much more! By the third week you'll be prepared for the next level of accelerated mastery. Taking the information you learned on Maximum Speed Reading one step further, Howard reveals how to use that information to increase your bottom line. These are the strategies you need to help fulfill your dreams, desires and professional ambitions! How this simple technique enables you to get into the maximum learning state. How blowing your nose reveals whether you're currently in a creativity or analytical mode. How to communicate more effectively and persuasively by reading people like a book – devastatingly powerful. Quick, fun and easy block-busting techniques for overcoming writer's block. The valuable skill for quickly and easily getting yourself into the "flow" state for solving problems ... and much, much more! 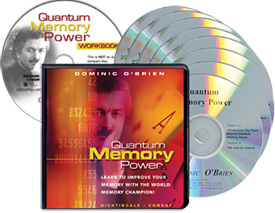 Quantum Memory Power – 8 CDs, 1 PDF Writable Workbook on Disc – a $129.95 value. Do you know boxer Muhammad Ali is the key to your photographic memory? In this remarkable program Dominic reveals how, along with amazing secrets of achieving a perfect memory with fascinating tricks, tips and techniques he's developed over 13 years. Be regarded as a genius and earn the respect and admiration of your peers, coworkers, customers, and yes – the boss! Can't place the face? No more! Use these simple techniques for remembering names and faces of everyone you meet – forever. Throw out your address book, calendar and shopping list – they're a thing of the past once you master the art of remembering numbers, dates, birthdays, appointments and telephone numbers. Recall and deliver a lengthy speech from memory – no need to look at notes – ever. This one's a real money secret! Be ready when the occasion calls for the perfect quote, anecdote or joke – become a walking encyclopedia that will impress everyone. Memorize an entire deck of cards as they're dealt and scare the casinos into banning you – AFTER you've won a king's ransom! Secrets of remembering anything you want – without trying ... it's automatic! Make laser sharp focused concentration so easy, it's like flipping on a switch – all this and much, much more! Your next week of following Nightingale-Conant's Supersonic Speed Learning System will open your mind to astonishing genius-level learning. Famed educator Donna Cercone believes you are a genius – and she'll prove it! Here's your powerful new system for processing and applying information at rapid speed. Using a surprising set of tools you won't believe, such as colored gels, you'll discover how to instantly increase reading, listening and memory skills as high as 100 percent – that's DOUBLE, by the way! How to pass any exam, including Bar or Real Estate, with ease: How to increase test scores by as much as 40 to 60 percent or more. The old ways of study are ineffective. Save your company a boatload of cash: How to cut corporate training programs in half – and look like a star! Raise retention 60 to 80 percent in people of all ages, from kindergarten to grad school intern to retiree – even you. Give yourself a success and earnings boost: Make yourself a reliable top performer in your field. It may have something to do with your favorite color. Devour trade journals, software manuals and other technical publications, and recall what you need at the drop of a hat. Discover how to access your multiple intelligences to activate your genius mind at will. Empower yourself and others, while dramatically boosting confidence and self-esteem – and so very much more! Finishing off in week six, you'll complete the final leg of Nightingale-Conant's Supersonic Speed Learning System. Get set, it's a doozy! Age-proof your brain and be smarter, sharper and more mentally agile at 70, 80 or even 90 – than you were at 30! The Nightingale-Conant internal research think-tank produced a remarkable program that actually allows you to keep the advances you've made in your intelligence, memory, reading and comprehension - forever. Strengthen your brain, increase your intelligence and prevent mental decline in just five minutes of brain-flexing a day! Keep your mind sharp, now and in the future. The FlexBrain Method reveals how your brain functions, delivering fun exercises to keep your brain stimulated and engaged at the deepest levels using quick, "neurobic" workouts. Is your diet dooming your brain to deterioration? Here's what to do about it – don't worry, it's not all broccoli and asparagus! What's the single best – and worst – thing to do for your brain? Hint: They’re not what you think. Secrets of living longer, healthier: An easy way to reduce your risk of dying of heart disease by 40% - you must know this. Can't sleep? Try this natural do-anywhere tranquilizer. Secrets of living a blissful life completely free of stress – here's how. Which foods are proven to increase your ability to focus and concentrate? How to become WHO you think about – plus, the secret to building muscle strength without moving a muscle – AND so very much more! That's six weeks of mind-blowing instruction by the top-of-class leaders in their respective fields of personal development – all designed to develop within you the World's Most Valuable Skill. After completing these programs you'll be a changed person. Not different, but changed. You'll be sharper, smarter, quicker to take on new challenges... with NO fear of failure. You'll embrace change and career-altering disruptions, understanding there's value to be mined from these challenges – if you have the right skill at the right moment. You'll rise to every occasion, garnering the respect and admiration of all while you confidently advance – never looking back! In this climate of exponential change – you'll meet challenges with exponential potential! 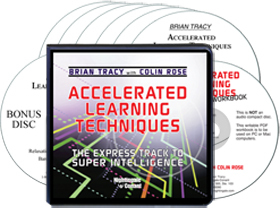 Accelerated Learning Techniques with Brian Tracy and Colin Rose – 6 CDs, Writable PDF Workbook, Bonus CD titled Relaxation &Visualization Techniques and Baroque Music to Set the Mood – a $79.95 value. Plus, the Accelerated Learning Techniques in Action DVD - $29.95 value. 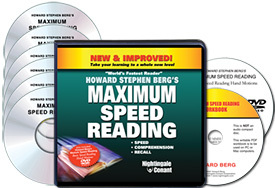 Howard Berg's Maximum Speed Reading – CD/DVD package, 4 CDs, 2 Bonus Discs, PDF Workbook and 1 DVD – a $89.95 value. 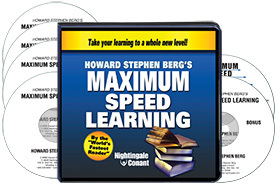 Howard Berg's Maximum Speed Learning – 4 CDs, 1 Workbook on Disc – a $79.95 value. A transformational collection of life-changing secrets, with a full retail value of an astounding $659.65! At Nightingale-Conant we subscribe to the notion that you give far more than you expect to receive – so we're including 3 FREE BONUSES to support, enhance and markedly increase the overall value to you, our preferred customer. FREE BONUS #1 is a Quick Start Audio CD narrated by Dan Strutzel, vice-president of publishing at Nightingale-Conant. On this CD, Dan takes you by the hand through the entire Nightingale-Conant Supersonic Speed Learning System, walking you through everything you get, laying out a six-week success plan for your development. Along the way he'll inspire and motivate you to get started and stay motivated throughout your learning. You'll know exactly what to do, when to do it and how to get going, immediately. 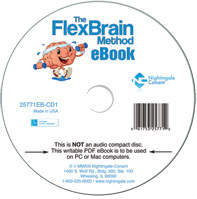 FREE BONUS #2: We're so proud of the work our internal research think tank generated on the FlexBrain Method, that we're also including the companion FlexBrain Method eBook – a $29.95 value for your continuing education. This eBook reinforces what you'll discover in the audio presentation – including illustrations that make the learning even easier – and fun! FREE BONUS #3: There's one more program I'd like to share with you – completely FREE. It's by the “Human Calculator”, Scott Flansburg. On this exciting presentation he'll teach you how to be a superhuman calculator too! Impress everyone with your newfound mathematical prowess. Numbers scare people, and they will be amazed with the ease you solve complex mathematical computations in your head – faster than they can use a calculator. In some cases, the numbers won't even FIT on a calculator! A quirky little "sideways" trick that makes adding and subtracting, multiplying and dividing a snap. Never again bounce a check because you made a mistake in your checkbook: How to manage your finances with ease – better than an accountant – and cheaper too! How to develop a solid, impressive mental grasp of numbers - and a foundation in math that will serve you your entire life. Not only how to be a human calculator, but a walking calendar too: How to figure what day of the week ANY date falls or fell on – this one will confound your friends! Fractions, decimals and percentages give you a pain? Not when you can figure them in your head ... all this and so much more! This is real world mastery that will come in handy every day of your personal and professional life. And again, it's all FREE – my gift to you. All three bonuses add up to an additional value in savings to you of $99.90. 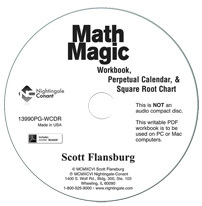 FREE Bonus #1: Math Magic – a $69.95 value! 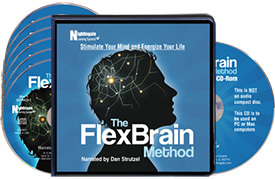 FREE Bonus #2: The FlexBrain ebook – a $29.95 value! I won't ask you to make your mind up now. You’ve got plenty of time for that. But I will	ask you to GET STARTED. After all, what're you waiting for? Click on the red button below to get this fantastic system delivered to your doorstep to try for 30 DAYS for only $1.00 with FREE SHIPPING. As soon as it arrives, open it, listen to Dan's Quick Start CD, then begin your adventure in advanced, supersonic learning techniques. Reap the benefits of using this system for an entire month before you even decide to keep it. If you decide it's not for you, just send it back at the end of the 30-day trial period. No questions asked, nothing more owed! Again, we've got you covered – for up to an entire year from date of purchase – No Questions Asked! If you become dissatisfied for ANY reason within one year of purchase – even if you simply change your mind – return it for a full refund of the purchase price. No questions asked! By reading this far, you've placed yourself dead-center at the crossroads. One path is akin to burying your head in the sand or continuing along the same path you've always trod. Who knows, you might even get lucky. You'll use the World's Most Valuable Skill to learn ANYTHING – quickly and easily – even a new language and you'll do it in record time! All this and so much more. So you see, your decision is practically made for you. Why don't you get started today? Go ahead, challenge us. Click on one of the fast-action response buttons above to get this amazing success system rushed to your door step. Your own journey to your genius mind begins today. Take action now. ✓ YES – count me in! I'd like to possess the World's Most Valuable Skill so that I can learn ANYTHING – safeguarding my future and insulating myself from the whims of ever changing technological and business disruptions. I want to go to the head of the class and lead through the eminent challenges while reaping the vast rewards in money, status, respect and admiration for my efforts! Please RUSH my personal copy of Nightingale-Conant's Supersonic Speed Learning System – including all 7 core program and the 3 FREE BONUSES – to try for 30 DAYS for JUST $1.00 with FREE SHIPPING. If I decide to keep the system, I'll make three easy payments of only $129.65 – an amazing 48% OFF the combined retail value of this system! – starting at the end of my 30-day trial. Otherwise, I’ll just return it after 30 days and owe nothing. No questions asked! P.S. On the fence? I don’t blame you for being a little skeptical, after all, I've made some pretty bold claims. But before you decide to pass on this opportunity I urge you to ask yourself, "what if Vic's right?" What if you really could position yourself to lead though the chaos of business and corporate change? What if you could distinguish yourself by having the answers and creative solutions everyone, including your boss are clamoring for? What if you really could double your reading speed and boost comprehension, learn anything with ease and recall any fact, figure or piece of information at the drop of a hat – what if you could make yourself invaluable, indispensable and irreplaceable in your career? Could that pay off for you? I bet it would – big time! For only a dollar, why don't you challenge me to prove I'm right. Get started today! 12-Month Money-Back Guarantee - Absolutely No Risk! At Nightingale-Conant, your satisfaction is our #1 priority – and it's 100% GUARANTEED. You can return your CD or DVD program(s) for ANY reason within 12 months for an exchange or refund of the program price.